This past week I was left with some puff pastry and though I could have used it to make dinner one night, I chose to keep this treasure to make a fun concoction. On week-ends I like to spend time in my kitchen and make up desserts. 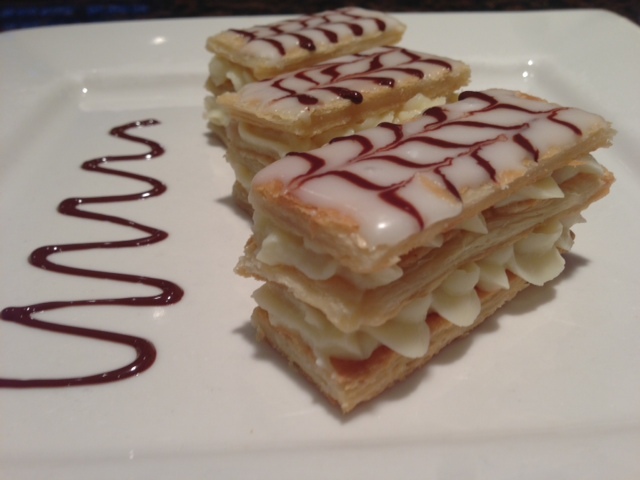 Yesterday I really wanted to do something fancy without spending hours in the kitchen and that’s when I thought of making a much admired French dessert called Napoleon. 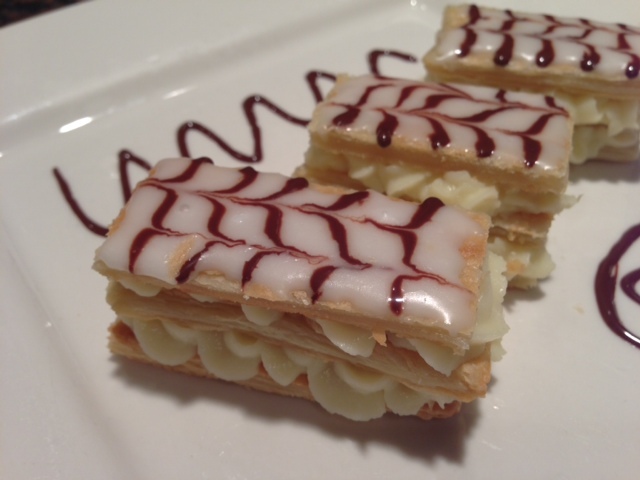 Though today this dessert is known as Napoleon, it used to be called Millefeuille which described this dessert perfectly, more so in fact that Napoleon. 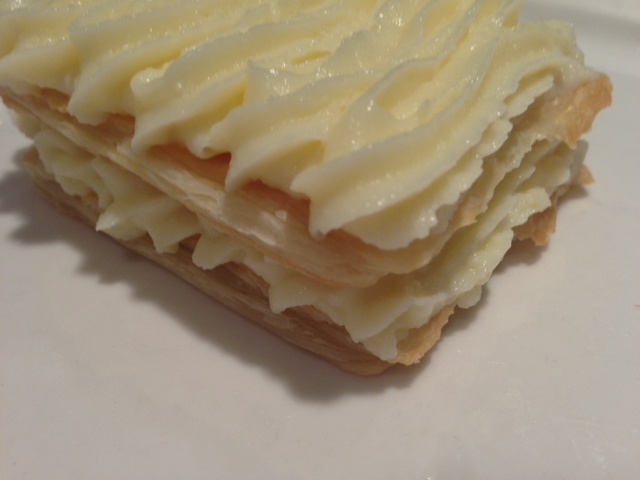 Indeed Millefeuille means a thousand layers which defines perfectly what a Napoleon is: a dessert made of 3 layers of puff pastries and pastry cream. 1 sheet of puff pastry thaw out in the fridge for 30 minutes. With a knife, cut the vanilla bean in its length. Then with the back of knife, push the vanilla seeds out of the beans and place them into the milk. In a small saucepan warm up the milk with the vanilla bean, and the vanilla seeds and bring the mixture to boil. Meanwhile, in large bowl, beat the egg yolks with the sugar until the mixture becomes whitish. Pour the hot milk into the egg mixture and stir. Place the milk/ egg mixture back onto the stove and cook until the mixture is bubbling and is becoming really thick. Remove the pastry cream from the stove, place it into a bowl. Cover it tightly with a plastic wrap and let it cool. While the pastry cream is cooling, prepare the layer of puff pastries for the dessert. 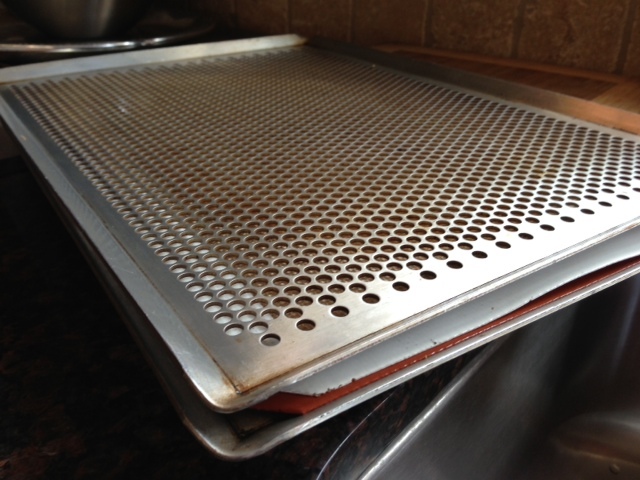 Place the off pastry sheet on the roulpat and with a rolling pin, spread the dough out to make a rectangle of 12.5 by 9. 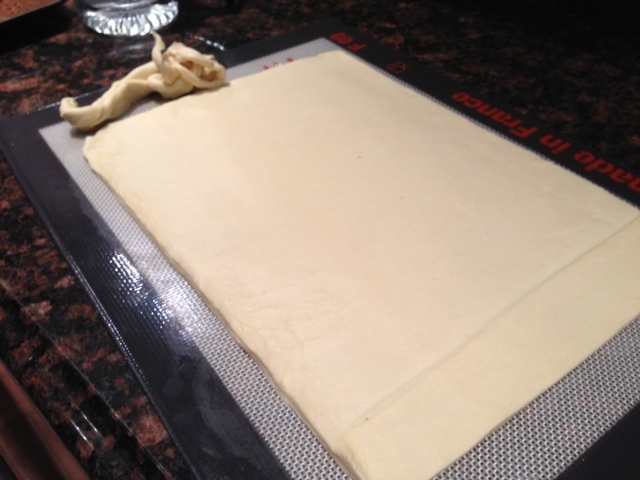 Roll the pastry into the roulpat and place it in the fridge to cool for 15 to 30 minutes. Remove the pastry from the fridge. 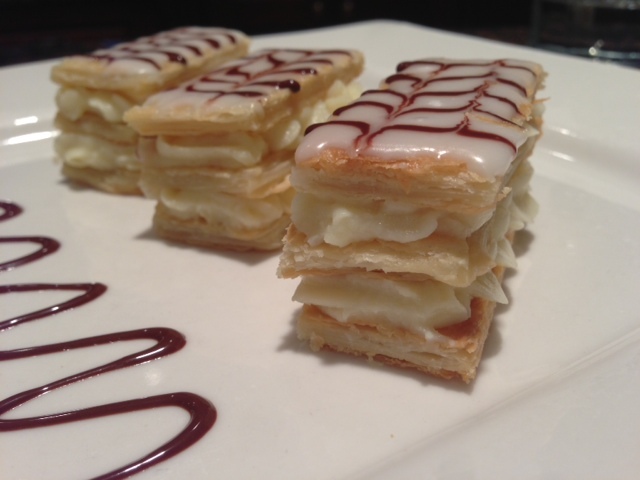 At this point you may want to cut equal rectangles to make the Napoleon. You would need 10 rectangles of about 2.5 x 4.5. 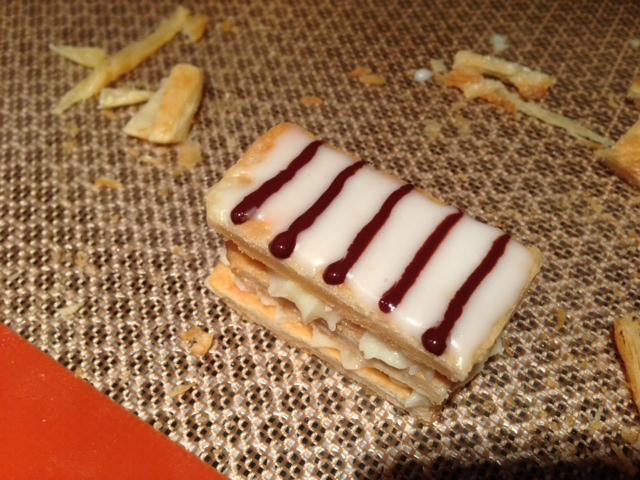 If you wish to make smaller Napoleon, I would advise to bake the phillo as a entire sheet and to cut it later. Place a silpat above the pastry. Turn it around and peel the puff pastry off the roulpat carefully making sure not to stretch it. Bake in a warm oven for 15-17 minutes. It should be golden. It may still be soft but it will harden as it cools down. Let the puff pastries cool completely before assembling the dessert. 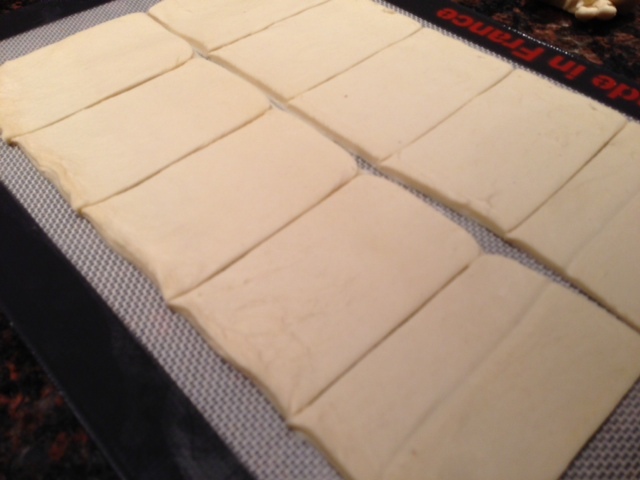 If you have not cut the rectangles before baking, you may do it now. You will need 10 rectangles of 4.5 x 2.5 or 40 rectangles of 2.5 x 11/4 for the mini ones. 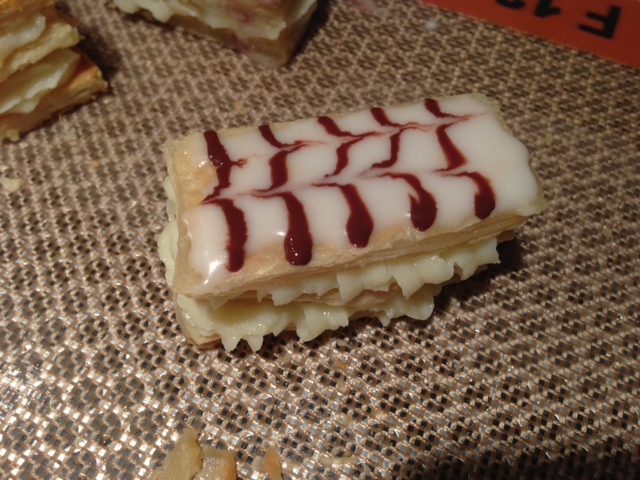 Pour the cream into a piping bag with a sscalloped tip and pipe the cream onto the first rectangle. Place another rectangle and pipe the cream again. Place another rectangle to finish. 1 plastig bag or ziploc bag. 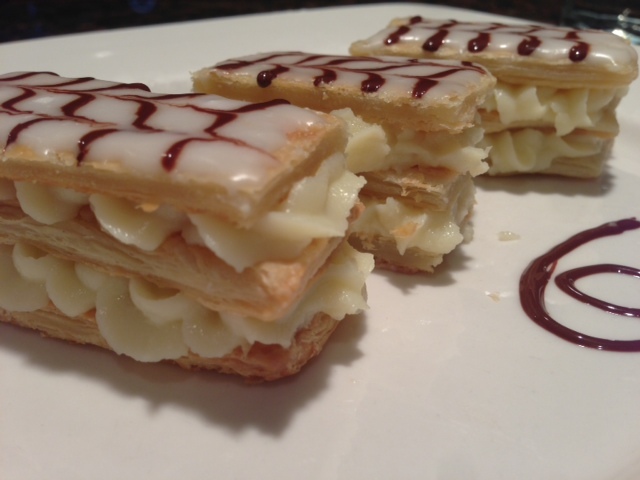 In a small container, mix the first 3 ingredients, and with a pastry brush, brush the icing over the top layer of each Napoleon. Melt the chocolate in the microwave for 40 to 60 seconds and pour the melted chocolate in a small ziploc bag. Cut the end of the bag to make a very narrow opening. Draw lines on the icing.